Pericytes are perivascular cells that play an important role in the development, maturation, and remodeling of blood vessels. However, studies of this important cell type on vascular remodeling have been hindered due to the difficulty of culturing pericytes in adequate numbers to high purity. In this chapter, we present a novel yet simple method to isolate and culture large numbers of pure pericytes from the mouse central nervous system (CNS). In our approach, vascular cells obtained from adult mice brains are cultured initially under conditions optimized for endothelial cells. Following two passages, the medium is switched over to optimize pericyte growth. After growing the cells for 2–3 additional passages, this approach produces a largely homogeneous population of cells that express the pericyte markers NG2, PDGFβ receptor, and CD146 but are negative for markers of endothelial cells (CD31), astrocytes (GFAP), and microglia (Mac-1), demonstrating a highly pure pericyte culture. 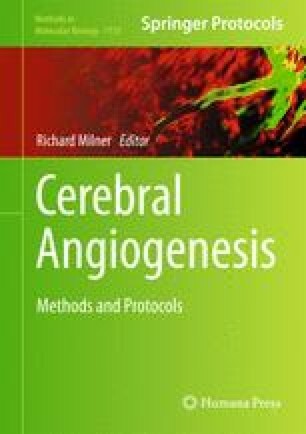 Thus, our technique provides an effective method to culture CNS pericytes that is easy to establish and provides large numbers of highly pure pericytes for extended periods of time. This system provides a useful tool for those wishing to study pericyte behavior. This work was supported by the National Multiple Sclerosis Society—Harry Weaver Neuroscience Scholar Award (RM) and Postdoctoral Fellowship (JVW-A)—by the American Heart Association (Western State Affiliate) Postdoctoral Fellowship (AB), and by the NIH grant RO1 NS060770.